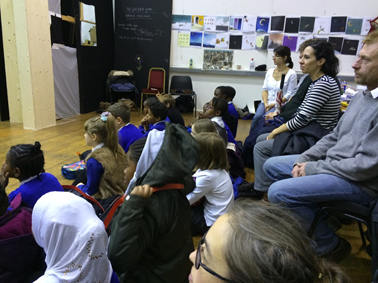 Pearl class were specially invited to attend a rehearsal of the production,’ The Way Back Home’. Although it was very short notice staff, parents and children were able to use public transport on a wet and humid day to get to the studios at West Hampstead. 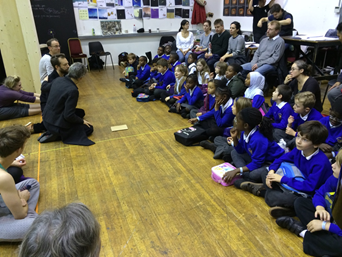 The children met with the entire production team including the director, conductor, musicians, performers, artists and stage/ costume designers. The children were enthused and invigorated as they were entrapped in the theatricals of the performance. At the end the production team were very impressed with the constructive criticisms made by our children . This rehearsal was also the perfect opportunity to see how drama is used as a form of visual poetry which coincidentally is the topic that the year four children are presently learning about.